The Ouachita National Recreation Trail is a 223 mile hiking trail that runs from Talimena State Park in southeast Oklahoma to Pinnacle Mountain State Park, west of Little Rock, Arkansas. Detailed trail maps made with high quality GPS tracks, overlain on USGS 7.5 minute topographic maps at either a true or nominal scale of 1:24,000 (1 inch = 2000 feet). This page is dedicated to all those miles I have yet to map. 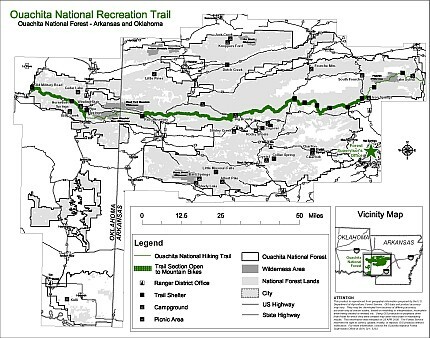 The best maps that I have found on the remainder trail were developed by Friends of the Ouachita Trail, or FoOT, in conjunction with the Ouachita National Forest. FoOt's home page will introduce you to the trail and the fine work their dedicated members are doing to make it one of the premier hiking destinations in the Midwest. If you are browsing this web site, you may be more interested in hiking the trail and want maps and information. They have that too. Either go to the About the Trail page of their web site or click here to see on overview map or the a 29 page information booklet that has mileage, maps and other information. 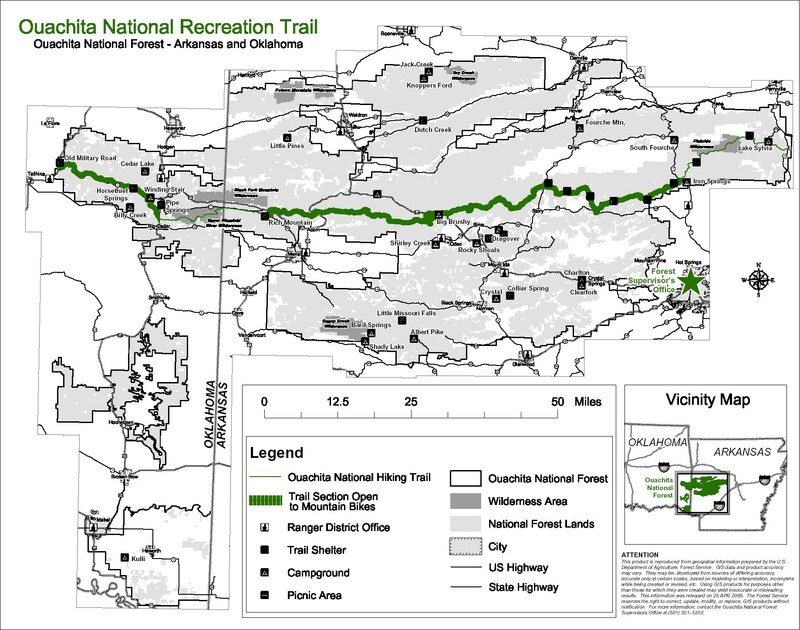 Unfortunately, since these maps were published by the Forest Service, the last 30 miles of trail which is outside the Ouachita National Forest is absent. (If you know of an online map that has it, let me know and I'll add a link). There is also a guide book for the trail by Tim Ernst's. Ouachita Trail Guide (April 2006, $18.95) has trail descriptions and very simple sketch maps of the trail. The maps show trail heads, major forest roads and a few major physical features. The maps are not suitable for navigation (no topos, no details). If you hike a section, get a high quality GPS track and want to share it, send it to me (cew5151@gmail.com) and I'll overlay it on a USGS topo and make it available as a free download for other hikers.